Why do some of my Millennial friends don’t want to go on 2 free trips to Europe? Being the oldest millennial around, I get to work with a bunch of co-workers that are at least 7-10 years younger than myself. I get to see their spending habits but knowing whether they do save money, or how they build their wealth is another matter altogether. 3 weeks ago we went to the nearby Ghim Moh market to have some cheap yet great food. I took the opportunity to ask one of my co-worker which savings account does he use to maximize his savings. He told me he does not used any special savings account. At first, I thought he is like me. He must invest and these savings are his dry powder to take advantage of market correction. He doesn’t invest. He told me the reason he does not find a savings account that yields a higher return is because he is lazy. And it turns out guys and gals like my co-worker is not an outlier. As a finance blogger, you tend have people gravitate to you that share common values, or searching for the same thing. Sometimes, you mistake some things as a given just because people around you do it. When Interest Rate is Low, where are the Motivations to Save? We lived in a time, where the interest rate in our savings account is very low. Last I checked, the interest rate on normal saving accounts is 0.05%/yr. 12 month fixed deposit yield an interest of 0.35%/yr. With such a low interest rate, many millennials questioned why do they even put money in a bank. If my co-worker saves $6000, the annual interest on his fixed deposit is $21. My friend has the option of spending the money now, versus depositing his money in a savings account, where his money will grow, and he would have more money to spend. Waiting for 1 year to get $21 is a poor motivator for my friend to delay gratify. Saving is a hard sell. Somewhere in 2014, OCBC Bank created the first hurdle savings account. I called these account hurdle savings account because you have to participate in a few of OCBC banks service. In return, the bank gives you a better interest rate. The hurdle interest can range from 0.35% to 3.5% depend on how many hurdles you fulfill. The problem for my co-workers is that these hurdles can be pretty tough to fulfill especially if you are starting out not earning too much. They are unsure if their spending pattern allows them to consistently fulfill these hurdles. As they are unsure, they do not make a move to create one of these hurdle accounts. For those that have created one of these hurdle saving accounts, they would struggle to earn the rates that was touted. If we failed to motivate the young folks to start saving, eventually it will become a greater society problem. To have a big pile of money, you need to start small. If you continue to funnel your money away to build wealth, you will eventually have a sizable pile. The table above shows the wealth a young adult can achieve in the next 10 years. He puts his money in a savings account that earns only 0.05%/yr in interest. He puts away $6,000 of his disposable income into a normal savings account. Every year, he puts 6% more of his increasing salary to his savings account. Eventually, he builds up $79,283 in 10 years. However, in total, he only earns $198.86 in interest in the last 10 years! If it is my co-worker, this $79,283 wouldn’t even take place because he wouldn’t be motivated to put away his money into savings on a recurring basis. What if we were able to boost the rate of return of the interest earned on your savings from 0.05% to 2.00%? Instead of having $79,283, my co-worker would have $87,493 in 10 years. The interest earned over this 9 year is $8,408 instead of $198.86. You could go on 2 big vacations such as Europe with this amount of money. Being intentional about finding a higher savings account. DBS have their hurdle account out for some time. I took a look at it then, and I gave it a pass. The main reason is the hurdle was too high. In order to earn the higher interest, the combined transactions based on all the segments, have to exceed $7,500/mth. Unless I have a high income, have a mortgage, invest a lot, I will not hit that hurdle consistently. The revamped DBS Multiplier is much simpler. Basically, there are no minimum limits on spending, salary, investments, insurance, home loans. All you have to do is do 1 salary credit + 1 category of credit card spending, investments, insurance or home loans to get an interest of 1.55%/yr to 2.08%/yr. If you do 1 salary credit + 2 categories, you can get interest of 1.80%/yr to 3.50%/yr. How much you can get depends on the amount of eligible transactions per month, that is above SG$2,000. 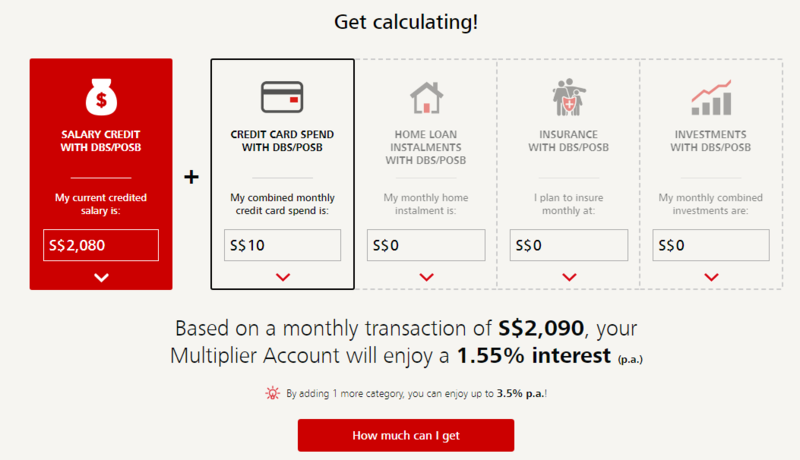 This higher interest applies to the first SG$50,000 in your DBS Multiplier Account. How do these different transaction band work out? Let’s go through some example. Let’s address my co-worker’s problem first. He doesn’t like to spend money, and when he spends, he spends it on food. However, he cannot quantify how much he spends on his credit card. This $2,090/mth transaction puts him in the 1.55%/yr interest band, in which he fulfills one category. In a simple manner, my co-worker would have stepped up his savings interest from 0.05% to 1.55%. Pro Tip: You can use the Calculator in the DBS Multiplier Site to Compute how much interest you can get. 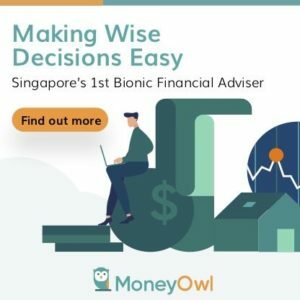 If, my co-worker can commit $100/mth to a POSB Invest Saver plan (which I wrote a comprehensive article here), he would be able to fulfil 2 categories. His $2,190/mth transaction, with 2 categories, put him in the 1.80%/yr interest range. The flexibility and no limits mean that you can hit a rather significant interest by not being forced to spend. My friend Adeline is 3 years younger than myself (She will kill me if she realizes I told everyone how old she is). Her total monthly transaction of SG$3,827/mth with 2 categories will enable her to earn 2.00%/yr in interest. On her average $40,000 balance, she could earn $800/yr in interest. When I have to close off my old POSB account, I decided to open a DBS Multiplier account. This is the account where I would transact my stock investments and where dividends are credited to. The Multiplier Account also has other Currency Wallets to store my cash in other Currency, much like DBS’s Multi-Currency Account. This allows me to change to different currencies when the currency rates are favorable. The buy transactions, if I use DBS Vickers as my primary broker, goes towards the eligible transactions. So does the dividend payments into the account from CDP. 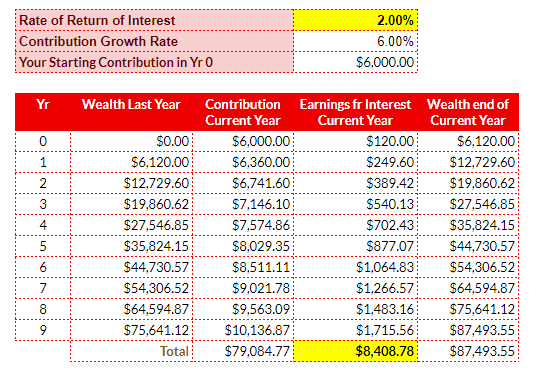 In this way, my annual interest earned from the DBS Multiplier accounts will fluctuate from 2.00% to 3.50%/yr. 3.50%/12 = 0.29% and some months I will get 2.00%/12 = 0.16%. As far as I am aware, DBS’s hurdle savings account is the only savings account where you can take advantage of if you use stocks to build wealth. Why is the flexibility and low minimum a big thing? These 2 factors become important when we try to ensure that before we switch over to another savings account, we can reliably hit these minimum consistently. What I come to know is that there are a lot of folks who struggle to fulfil the credit card spend. The current average minimum for the other banks is $500/mth. The table above lists the minimum requirements to be eligible for bonus interest for each of the banks. The second row lists the type of transaction exclusions for each individual banks that counts towards the $500, $1,500, $2,000 min spend. The trend is to ensure the spending consist of mainly retail transactions, payments for insurance, mobile phone bills, cable TV and broadband bills, groceries. For older working adults, or workers who are able to charge expenses to credit card and claim from company later, they do not have a problem hitting this minimum spend. These other hurdle accounts can provide a more attractive interest. The majority of the potential customers will fall into the range of $2k to less than $15k. In this range, you can earn between 1.55% to 1.90%/yr interest if you fulfil 1 more category or 1.8% to 2.2%/yr if you fulfil another category. This interest range is small, yet the interest earned is substantial enough, for us to consider it. And all this, with very little “hurdle management fatigue”. The table above shows a typical above middle income earner that is able to fulfill 3 of the most standard categories. BOC Smartsaver and Maybank Saveup both provide better overall interest rates at various account balance bands. However, below $50,000 account balance, DBS Multiplier is competitive against OCBC, UOB, BOC and SCB. If you are able to meet the hurdles of Maybank Saveyo, they have the highest interest if you can fulfil 3 categories. This low hurdle, and flexibility will allow you to take advantage of better deals. To get a good interest, you might engage in hurdle management, trying to squeeze in services into one bank so that you can get a better interest rate. Other banks might be able to offer a better deal, and because you are not tied in, you have a choice. For example, while we know DBS World Woman’s Card is a good card to collect miles’ points but if you are someone who wine and dine clients a lot, you can tap the CIMB Visa Signature card which offers 10% rebate on dining, capped at $60 a month. If you have more cash, you could have combined with other savings hurdle account. For example, you can earn 2.4% interest on UOB One Account, whose hurdle is credit card spend + bill payment. If you have $120,000, you could pair it up with DBS Multiplier to get an average of 2.3% interest on 120,000. DBS have made account opening a breeze. And if you have a normal POSB or DBS account, you do not need to go down to the branch office to open a DBS Multiplier account. If you have an existing POSB/DBS account, simply login to your internet banking. Go to Apply then Deposit Accounts. Click on Instant Apply and you can open an account without going to their branch! Sometimes we need to give ourselves some motivation to do something hard. To not spend now, and to delay gratify you need something that is a strong pull factor. These savings account provide a good interest rate that is more motivating to put away your money so that eventually you have a bigger nest egg for your child’s education or retirement. It fits the young adult starting work with a low net spend and want to be frugal with their money. It also fits the people who has bank with DBS/POSB all these while that are getting fatigued by the high hurdles forcing us to spend more of our money. It fits the investors having spare cash and would like to have an account as their cash ammunition earning a good interest rate. It also fits those who wish their credit card spend or other services to be on other financial institutions and not being tied by the rules of hurdle accounts. You can find out more about the DBS Multiplier Account here. These are the folks who are still trying to figure things out, and have a smaller salary and less financial needs such as investments, insurance. A flexible product, with no fixed minimums and an interest rate that is high enough will certainly reduce the inertia for them to start saving and building up wealth. This article is written in partnership with DBS Bank. I am a current DBS Multiplier Account User. The views expressed here are that of my own. For those that are starting out, their salary credit might be below $2,000. You would not be able to hit any of the hurdles. If its based on Salary Credit and Credit Card Spend. You could however still hit a higher rate based on 3 bill payment or GIRO payment. The highest rate that you can hit probably is with UOB One with their $500 min credit card spend and 3 GIRO Payments for 2.40% interest. But the credit card spend will be a high hurdle if you are earning less than $2,000 disposable income. The DBS Multiplier would be able to fit this with their flexibility. You can have a salary of $1,800, contribute $100 to POSB Invest Saver, and $100 in credit card spend. Or $200 in credit card spend to hit this amount. If you have a median salary and have $500 in credit card spend, the BOC Smartsaver and UOB One is good. If your balance is from $3,000 to $40,000, DBS Multiplier is competitive with those 2, and with the flexibility, you can have a few ways how to hit this. You can have $2,300/mth in salary credit and $200/mth in credit card spend and you can hit this. You should read up on the FAQ but I would like to highlight some of them here. I written about the DBS BYOB & SAYE account here. The SAYE gives you 2% interest on your contribution to your SAYE savings account, and 2% to your DBS Paylah. The requirements is to contribute salary to any DBS/POSB account, 5 credit card transactions, and a monthly contribution to the SAYE account. The salary credit satisfy for both the SAYE as well as DBS Multiplier. The credit card transactions satisfy both the credit card transactions of SAYE and go towards the transactions of DBS Multiplier. To earn from both. This can happen if you are under 30 years old, have a lump sum (for DBS Multiplier) and can contribute to SAYE. Your realistic interest is up to $50,000 of 1.55%-2.2% for DBS Multiplier and Up to $3,000/mth contribution to SAYE. As of now the SAYE promotion has ended. Hi. You think that multiplier account can be layered with BYOB? I signed up for both. Hopefully can earn interest on both of them. Hi F4FF, i think you can. however, you will need enough to contribute to both the SAYE and have enough stated in DBS Multiplier to enjoy the interest both sides. I’d like to point out that dividends from CDP are not considered in this case. I had the same thought as you but when I checked with the bank, they are only referring to dividends coming from unit trusts bought with the bank. HI Anon, this is strange according to the FAQ it stated CDP. Great article as always, with in depth analysis. But the opening title is a bit inaccurate, as it it based on a 10 year timeframe, and so far, none of the hurdle savings accounts has survived even half of that period without changing their T&Cs. Hi Raymond, it is true that non of the hurdle accounts have survive for 10 years, but that is what we try to aim for. The push towards greater interest rather than staying on lower interest, is the objective. Always be finding a good enough return. Even if the hurdle accounts do not survive, the said person can hunt for Singapore Savings Bonds, Short term insurance endowment, bonds, and other fixed deposits like CITIBank Maxgains. Hello, i just “instantly” sign up for the multiplier account and i was wondering when will this acc start? I have yet to transfer funds from my other account + change set up giro for my salary. Currently, the multiplier has $0. So by when do i have to get the funds in so that i don’t get deducted $5 for being below $3000? Thank you!